Eagles vice president of football operations Howie Roseman. After two weeks of free agency, the Philadelphia Eagles have not yet addressed the most glaring hole on their roster, the running back position. Instead, they have stayed true to form, prioritizing the trenches and devaluing the running back position, a smart way building an NFL roster, but also a frustrating philosophy to some fans who would love to see a stud feature back in the Birds' backfield. 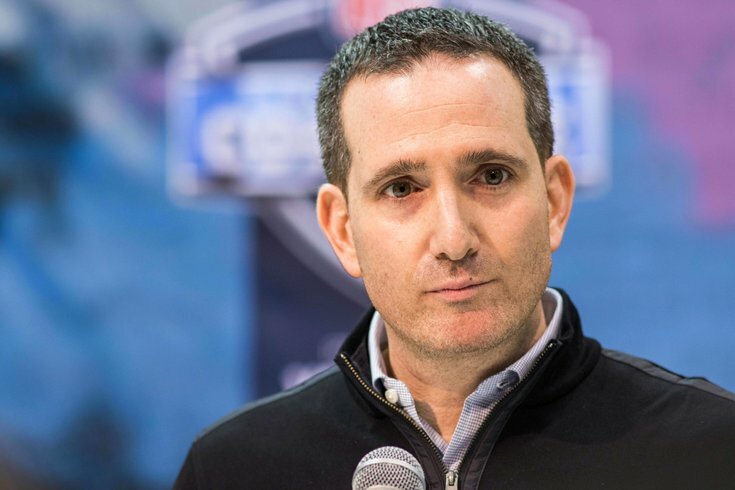 At the NFL annual meetings in Phoenix, Howie Roseman answered a number of questions about the Eagles' inactivity in the running back market in free agency. If his words are to be believed, a stud running back will not be joining Carson Wentz in the Birds' backfield in 2019. What they're saying: Is Jay Ajayi an option for the Eagles at running back? "Going into free agency, it was very important for us to stay true to our beliefs," Roseman said. "That’s the O-line, the D-line, getting an opportunity to get Ronald Darby back, look at playmakers for our quarterback. And when we talk about playmakers, we don’t just talk about running backs, wide receivers, or tight ends. We talk about that position group as a whole. There’s a long way to go in this offseason." Roseman also pointed to the success of an inexpensive running back group in 2017 that helped the Eagles win a Super Bowl. "The three running backs who played in the Super Bowl [LeGarrette Blount, Jay Ajayi, and Corey Clement] were guys we acquired after the 2017 draft, so the talent acquisition period continues to go," Roseman noted. So what if the Eagles don't sign a running back prior to the draft? Will they feel obligated to select one in one of the early rounds? "I just go back to our history over the last couple of years, and we’ve been fortunate to win a lot of games with the running backs we have on this roster," Roseman said. "We have opportunities to acquire backs not only before the draft, but after the draft process, and so we’re going to continue to look at every position, look at ways to improve our football team. We want to be as good as possible at every single position, but it will not put us in a position at any spot where we’re forcing something in the draft because that’s where you make mistakes." As currently constructed, the Eagles have arguably the worst running back group in the NFL on a roster that is otherwise primed to contend for another Super Bowl. If there was ever a year where they might draft a running back in the first round, this is it, with Alabama's Josh Jacobs being the most likely target. If Roseman's words are to be believed, that's probably not a direction they will go. Of course, this isn't exactly the time of year that NFL general managers tend to be publicly honest.